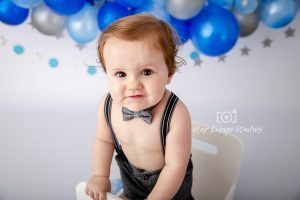 I had the absolute pleasure of capturing Braxtyns cake smash session last week! 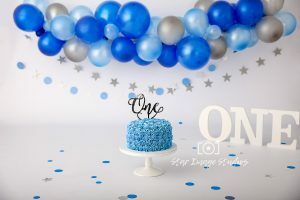 It was a simply sweet set up decorated with blue and silver balloons and the cake was a two tier with blue rose icing. Braxtyn was such a happy little boy with some seriously cute smiles thrown my way, it made my heart melt! He had only had a quick nap earlier in the day too – you wouldn’t have even guessed! This was also his first time tasting cake and it was safe to say that he LOVED the icing! Cake smash sessions are always so much fun. Just watching the children taste and explore all the wonders of CAKE! and for the parents to then sit back and see all the facial expressions and laugh with the little one is priceless! Below is a short clip from Braxtyn’s cake smash session for you to enjoy.. 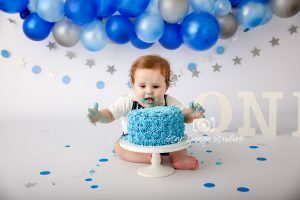 If you are ready to schedule your own cake smash session, please fill out a contact form and you will be sent a session brochure. Or check out our cake smash page here.